Welcome to Oberheiden, P.C.’s website. Oberheiden, P.C. (the “Firm”) is a limited liability partnership registered in the State of Texas with a principal office at 5728 LBJ, Suite 250 in Dallas, Texas. Your use of any Firm associated website (collectively, the “Website”) and any features therein are subject to these terms and conditions (the “Terms”). No content on this Website or affiliated links going into this Website or originating from this Website under the control of Oberheiden, P.C. are meant to be misleading. See Bates & Van O’Steen v. State Bar of Arizona, 433 U.S. 350 (1977). Oberheiden, P.C. operates this Website and publishes information on this Website. This Website and its domain name are owned by a third party. The responsible attorney for this Website is P.C. Meyer. Firm is not a national firm (e.g. with national presence), but Firm does service clients in numerous states, where appropriate, and subject to these Terms. Firm does not have any office outside the State of Texas. Firm does not have a substantial physical presence outside of Texas. Meeting locations listed on Website are not owned by Firm and do not constitute offices. Phone calls from all listed phone numbers are answered in Texas or forwarded to the mobile phones of Texan residents. Firm does not own any property or inventory in any state outside of Texas and Firm has no payroll obligations in any state outside of Texas. This Website and the materials on this Website have been prepared by Oberheiden, P.C. to provide general information about law, legal issues and legal developments. As such, the Website and its content does not constitute or contain legal advice, legal opinions or any other form of advice regarding any fact or circumstance. Do not act or fail to act upon any Website information without seeking professional legal counsel. WARNING: Communication between you and Oberheiden, P.C. via this Website should NOT be interpreted as establishing an attorney-client relationship. Do not send Oberheiden, P.C. any privileged or confidential information unless Oberheiden, P.C. has accepted you as a client. We cannot maintain the confidentiality of information received outside the attorney-client relationship. By your access or use of this Website, you agree and certify that any communication or material you transmit to this Website or the Firm, in any manner or for any reason, will not be treated as confidential or proprietary. We do not seek to represent anyone based solely on a visit of the Website. Of course, we want to hear from you but do not send the Firm any information about any matter involving you until you receive an executed engagement letter or other in-writing confirmation from the Firm that we represent you. After you become a client of the Firm, if you have confidential information to share with us, please contact us first to ask how best to share that information with the Firm. In any case and without limitation, your access or use of the Website does not create an attorney-client relationship. Your access or use of this Website does not make you a client or a prospective client of the Firm. Some of this Website’s case summaries, reports of past cases (and their outcomes) and the description of experience and past legal services in a lawyer’s profile’s outline and describe past cases handled by the Firm, Oberheiden, P.C., or lawyers of either of those firms. They are not intended to serve as a guarantee that the same or similar result can be achieved in every matter or in your case. You must not assume that a similar outcome and case result can be obtained in your case. Each case is different and the outcome of each case depends on a variety of factors, such as specific facts, circumstances and laws that apply to the matter. Unexpected developments beyond the control of any client or lawyer may further make your case substantially different than cases handled by Firm’s lawyers in the past resulting in different and perhaps even negative outcomes in your case. Any case results noted on this Website do not guarantee or predict a similar result in any future case. Unless otherwise expressly specified, the attorneys listed on this Website are not certified as specialists or experts by any professional or governmental agency or authority. Mentioning of Firm’s practice areas, practice focus, expertise, or legal experience are not intended to suggest board certification or to denigrate other law firms or attorneys in any way. Our attorneys are licensed in the jurisdictions listed in their respective profiles and our attorneys do not and do not intend to advise clients on the laws of states in which that respective lawyer is not licensed. Oberheiden, P.C.’s practice is predominantly federal law and we may affiliate or form relationships with lawyers throughout the United States. The laws of each state vary and you must not assume that general information on the law that you may find on the Website, in particular regarding the “Statute of Limitations” (which set deadline to bring a suit), accurately reflects the law in your state. Blog posts and Website content specifically, are provided for general educational and informational purposes only. They may not reflect the law or the current law in each jurisdiction. 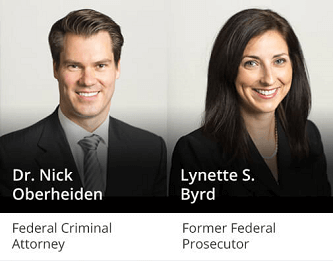 No information contained in the blogs should be construed as legal advice from Oberheiden, P.C. or the individual author, nor are blogs intended to be a substitute for legal counsel on any subject matter. No reader of the blogs or any other website information should act or refrain from acting on the basis of any information included in, or accessible through, the blogs or the website information without seeking the appropriate legal advice on the particular facts and circumstances at issue from a lawyer licensed in the reader’s or recipient’s state, country, or licensing jurisdiction. References to “we” or “our attorneys” and the like include the accomplishments of the Oberheiden, P.C., the predecessor of Oberheiden, P.C., as well as the individual accomplishments of all current attorneys whether at Oberheiden, P.C. or elsewhere.